Twiggy, Peggy Moffitt, Amy Winehouse and Taylor Momsen are four ladies who are known for known for their unique, bold eyeliner looks amongst other things. They styles are so unique that they are almost synonymous with the stars. Twiggy (Lesley Lawson) is an iconic model from the 1960s. She was so skinny that she was renamed as 'Twiggy' by the industry and the name stuck. Before the 1960s, a woman's curves were celebrated (just think of Marilyn Monroe and Elizabeth Taylor). The 1960s was a revolutionary time (click here if you would like to read a blog post on that decade); women were stepping out and were not confiming themselves to being the housewife. The mini skirt was invented and the birth control pill was invented so that women could be in power of their sexual prowess. The 1960's also celebrated big hair and humongous eyes. Twiggy was no different. Bold cut crease, drawn on bottom lashes, white liner on the bottom water line and a set of fake lashes all add to the look. Peggy Moffitt is another iconic star from the 1960s. She was an American model who developed a signature make up style which is reminiscent of the kabuki dancers of Japan. She was a muse for the designer Rudi Gernreich. As well as her extremely vibrant and unique eye make up, Peggy was also known for wearing an asymetrical hairstyle, which was put together by Vidal Sasoon. Amy Winehouse's style was heavily influenced by the 1960's band the Ronettes. She wore her hair in a big beehive, which became part of her signature look. Over the years Amy's hair style became more and more exaggerated. 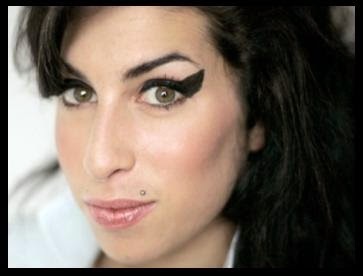 She was also known to sport a thick, exaggerated winged line, also reminscent of the 1960's. The youngest and most current of the eyeliner crew is 21 year old Taylor Momsen. She is an American actress/ musician/ model. Taylor rose to fame when she stared in the hit TV show, Gossip Girl. She is one fourth of the American rock band, Pretty Reckless, where she is the lead vocals and does rhythm guitar. Other than her career, Taylor is also known for her make up. She sports a very bold look, deep, dark eyes with thick liner on her waterline and lashes. The rest of her look is very neutral. This is a very bold, statement look and it makes her look evey bit of the rock star that she is.